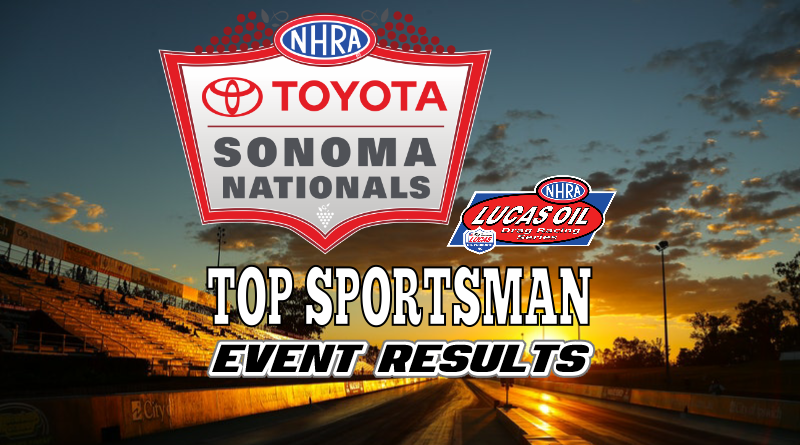 SONOMA, Calif. – In the Top Sportsman final round at the NHRA Toyota Sonoma Nationals held at Sonoma Raceway, first-time finalist Ken Ratzloff captured the event championship with a win over muli-time winner Ted Kellner. Ratzloff, of Idaho Falls, Idaho, drove his ’53 Studebaker to the win on the strength of four all-out passes, all of which were within a couple of hundredths or less of his dial-in. Ratzloff reached the finish line first in every round and his .025 R.T. average allowed him to take the holeshot advantage in all but one round. Ratzloff had his worst light of eliminations (.052) in his round one tangle with Steve Galileo but still took a large starting advantage when Galileo missed the tree with .099 R.T. Ratzloff ran .013 over in taking .028 at the stripe (about 8 feet) for the win. In round two, Ratzloff used a .015 to .035 R.T. advantage to take out Dean Hall. Ratzloff once again reached the finish line about 8 feet in front of his competitor and ran .011 over his dial for the win. Ratzloff’s third round opponent, Keith White broke shortly after leaving the starting line which allowed Ratzloff to coast to the easy win and claim his spot in the semifinal round. Ratzloff squared off against Joe Roubicek (number 9 in the world last year) in the semifinals. Ratzloff’s .014 R.T. gave him a .025 holeshot which he parlayed into a 6 foot win at the finish. Although Roubicek ran dead on his dial, Ratzloff’s one over 7.20 E.T. gave him the win. In the final, Razloff won his closest race of the event against veteran San Jose, Calif. based racer Kellner. Kellner had been wielded to the tree all weekend as his worst light across eight passes was a .014. His .011 R.T. average in eliminations was instrumental in helping him reach the final round. Kellner’s ’01 Firebird was also on the money all weekend as well. Kellner ran a 7.28 E.T. in each of the first three rounds, followed by a 7.29 in the fourth round. Like event winner Ratzloff, Kellner made all-out runs in every round, only going under his dial in round one. Kellner faced some tough competition during the event including three straight rounds where he used .02 packages to defeat former world champ Mike Ferderer by .006, last year’s number 3 driver Ed Olpin, and multi-time national event winner Jeff Gillette. The final was ultra close as the racer’s reached the finish line within a foot of each other. Ratzloff’s .004 initiated .030 over 7.230 E.T (.034 package) defeated Kellner’s .038 package. As stated earlier, both racer’s drove it out the back door for a .004 margin at the finish line. A great final round and a hard-fought victory for Ken Ratzloff. Congratulations to Ken and his team on their first national event victory!